A powerful neodymium magnet gives the graphite‐commutated 1727 CXR DC motor a high power density with a continuous torque of 4.9 mNm. At 17 mm in diameter and 27 mm in length, the compact 1727 CXR can be used in temperatures ranging from ‐30 to +100°C. 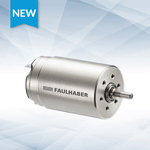 The high performance of the 1727 CXR motor provides an ideal solution for compact applications ranging from surgical or tattoo instruments, to advanced robotics. A trim-and-drill tool, developed by researchers at the Oak Ridge National Laboratory for Boeing, has received the title of largest solid 3D-printed item by Guinness World Records. The tool was printed in only 30 hours using carbon fiber and ABS thermoplastic composite materials. It will be tested in building the Boeing 777X passenger jet. 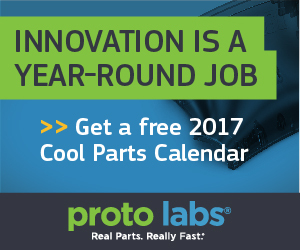 Get your Proto Labs 2017 calendar today. It's filled with great tips and resources. For short runway and/or high-speed landings, military aircraft use parachutes to safely stop the vehicle. These parachutes are tested in full-scale wind tunnels to measure the drag force they generate, and the aircraft structure must be able to withstand the drag force without failure. By harnessing an in-line load cell, test engineers can accurately measure the drag force of the parachute, the load on the airframe, or the completed system in real time. With the help of innovative new chips that can convert analog radar and other electromagnetic signals into digital data that can be processed at unprecedented speeds, warfighters can look forward to enhanced situational awareness in the midst of battle. Kia Motors has revealed details of its advanced new eight-speed automatic transmission (8AT), engineered for use in front-wheel drive vehicles. The new front-wheel drive 8AT has been developed in-house by the Korean manufacturer, engineered to offer a high level of mechanical efficiency and smooth gearshifts. Crucially, it occupies the same space as a conventional six-speed automatic transmission, but weighs 3.5 kg (7.7 lb) less. Expanding on the company’s rapid injection-molding offerings, Proto Labs has launched its overmolding service using engineering-grade thermoplastics and liquid silicone rubber materials. This new capability can produce 25 to 10,000+ custom overmolded parts in 15 days or less. It gives designers and developers one more tool to make high-quality prototype or low-volume production parts quickly. 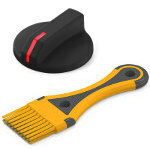 Overmolding is used to improve grip and durability, dampen vibration, and to add two-color aesthetics to parts. The process can also reduce manufacturing costs by simplifying multi-part assemblies. Click here to learn more and read design guidelines. PianoArc has struck a resonant chord in the world of music by pioneering incredibly clever circular and curved keyboards for performers at live concerts and stadium events around the globe. But one of the assembly challenges for the designers from the outset was how keyboard units could be attached securely to compatible stands. For this critical function, PEM self-clinching nuts from PennEngineering became the keys to success. The LRS-18 LVIT series sensors from Alliance Sensors are spring-loaded, contactless devices designed for dimension- or position-measuring applications in factory automation and in various industrial and commercial applications such as automotive testing, mil/aero test stands, robotic arms, and packaging equipment, where the sensing element cannot be attached to the object being measured. The LRS-18 stroke-to-length ratio is excellent. Existing technologies with similar electrical specifications are 9 in. long to measure 1 in. The equivalent LRS-18 is only 4 in. long. 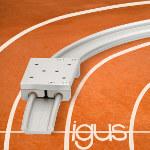 Based on the proven line of drylin W linear plain bearings, motion plastics expert igus has introduced linear rails bent to custom radii, along with adaptable carriages that can self-align between straight linear runs and curves without binding. This new addition to the drylin W toolkit allows for entirely new possibilities in applications including marine, aerospace, and stage technologies. Like all drylin systems, the new curved rails and self-aligning carriages operate without the requirement for any external lubrication or maintenance, and offer easy installation. To compensate for rail spacing, a pivoting spherical ball, made of self-lubricating iglide plastic materials, is used in the new self-aligning carriage, allowing for movement on flat, as well as convex or concave curved rails. High-performance polyimide can serve as a valuable alternative to metals in demanding applications where weight reduction is also needed. Well-suited for use throughout diverse industries, this lightweight polymer is stable across a broad temperature range (-270 C to 300 C) and offers other outstanding characteristics, such as: superb radiation resistance, low outgassing in vacuum, excellent electrical insulation properties, low flammability, and high strength. Goodfellow offers polyimide in a range of forms that include films, laminates, sheets, rods, tubes, and fibers. The comprehensive range of Kapton (polyimide) films includes unfilled (HN) and a number of filled grades with enhanced performance. 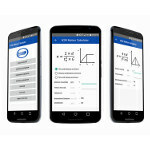 To help their customers understand their motion requirements and translate them into acceleration and force values, H2W Technologies has developed an Android application that solves linear motion calculations, with a range of velocity profiles. This helps the user understand which product might work best for their particular application. The motion profiles available in the calculator include triangular, trapezoidal, and sinusoidal acceleration. Force and duty cycle calculators will also help to give a more complete understanding of an application’s requirements and constraints. After three years of battling difficult weather conditions at the Wendover, UT, Bonneville Salt Flats track, the Ohio State University’s Venturi Buckeye Bullet 3 student team and driver Roger Schroer rallied to push their electric streamline vehicle to a world-record two-way average top speed of 341.4 mph. A team of Cornell University students guided by a former senior official at NASA is attempting to boldly go where no CubeSat team has gone before: around the moon. And not only is the group attempting to make a first-ever moon orbit with a satellite no bigger than a cereal box, it's doing so with propellant that you can obtain simply by turning on a faucet. Western Digital Corporation unveiled its SanDisk 1TB (terabyte) SDXC card prototype at the at Photokina 2016 trade fair in Cologne, Germany, in September. With increasing demand for high-resolution content, such as 4K and 8K, the company keeps pushing the boundaries of technology with solutions that support the exponential growth of data-intensive production demands. 34 days was all it took for fire equipment manufacturer Task Force Tips to pay for its collaborative Universal Robots through productivity savings. Watch how two UR5 robots working in tandem use vision guidance to pick blanks off a conveyor for CNC milling, with huge gains in productivity and quality. The application requires no scripting and was created by a journeyman machinist with minimal training. "Roadshow" runs down the best production and concept cars from the 2016 Paris Motor Show. The designs can get pretty outrageous, but as vehicles of inspiration, they can also run out of gas. Our favorites? The Renault Trezor electric GT, which really looks like a RoboCop vehicle, and the prototype Honda Civic Type R, which gains 100 points in street cred for trying to look like a Fast and Furious bad boy.